I spend a lot of time gazing down as I fly across the country. I’ve seen plenty of fires in regions that seem sparsely populated. I’ve flown into regions such as Jackson Hole, Wyoming where the visibility was reduced due to smoke from nearby forest fires. 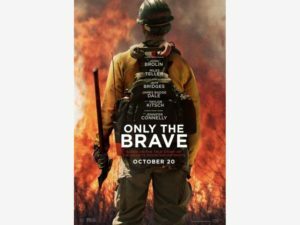 After watching this film, I now know what it’s like to see those same fires up close and personal. This film is a showcase for filmmaking at its finest. Everything about this movie is superb with one small exception, which I’ll get to in a minute. Like the movie Apollo 13, most people already know the ending of this story. Nineteen men out of a team of twenty fire fighters lose their lives. That, however, should not prevent you from going to see it. The forest fire scenes ring authentic. I’m sure there were some special effects involved, but I felt that I was right there fighting those fires, with embers raining down on me and strong winds whipping up the flames. The script was well done. The acting and cinematography were first rate as was the score. My one and only problem dealt with one side of filmmaking I hardly ever notice – makeup. As good as this film is, my one issue with it is that in too many scenes the actors portraying the firefighters show up looking like they’ve been out fighting forest fires. I get it. Fighting forest fires is dirty work. But I’m pretty sure that once they’re done fighting those fires they take a shower. It bothered me enough that it completely took me out of the story. Every time I saw Josh Brolin or Miles Teller with smudge marks on their face when there was no reason for them to have dirty faces, I was taken out of the world that the filmmakers were trying to show. All I could think about was how stupid it was in that particular situation. Here’s one example: Miles Teller walks up to his girlfriend’s house with a bag of diapers and other baby items he wants to deliver. When his girlfriend comes out to thank him and offers to let him hold the baby, he initially declines stating that he was dirty having just got back from work. The scene didn’t work thanks to the whole I’m too dirty angle the writer was going for. He could have accomplished the same thing in a different, more authentic way. My suggestion is to see this on the big screen before it’s gone.